America’s premiere Robin Williams tribute artist and impressionist, Roger Kabler, will perform acts from his Robin Williams Tribute Show. You will feel like you are in the presence of one of the funniest and most heralded comedic icons of the 21st century. 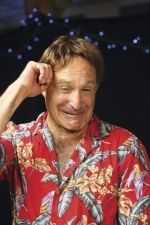 Robin was not only a wonderful actor and stand-up comedian, but a philosopher and humanitarian. The show you will see is funny, poignant, and sometimes just a wild ride through the mind of a lovable madman. Robin seemed to always be teetering on the edge of childlike innocence, making him a remarkable performer. If you never had the chance to see him in concert, now is the time to feel like you did. About the performer: Roger Kabler is a true renaissance man. Along with being one of the finest comedy impressionists in the country, he is a talented actor and portrait artist. He served as the Zima spokesman in national television commercials. He was a regular on the last Carol Burnett series in 1991. Roger also starred in his own NBC sitcom “Rhythm and Blues”. Roger wrote, produced and starred in the award-winning movie “Who the He** is Bobby Roos?”, and has recently played to sold out Las Vegas showrooms. Variety magazine calls him “an astounding impressionist”.